Take me out . . . to the playground! For a fun family outing, it's hard to beat going to a baseball game, and the new generation of ballparks has made the experience even more family-friendly. That's exactly what the United Shore Baseball League had in mind with Jimmy John's Field in Utica, Michigan. Home of the Utica Unicorns, this state-of-the-art venue is as kid- and family-friendly as it gets, right down to the "Kid Zone." In planning this play area, they knew they needed a design just as innovative as the ballpark itself. It would need to fit into a relatively tight, triangular space, with capacity and durability to handle lots of play traffic. It also would need to have a fresh style with contemporary relevance to match the rest of the ballpark. After reviewing a number of manufacturers' proposals, they found the perfect fit—partnering with Playworld to create a nature-play inspired playground featuring the innovative new Playworld creation, Branch Out. Designed to engage kids ages 5-12, this original design breaks out of the post-and-platform box with a tree-like central component that serves as a focal point and hub of activity. Its striking form and scale attracts attention and investigation, while a multitude of entry points, play paths and activities deliver high-value physical, intellectual and social play. Vine-like ropes and dynamic climbing nets offer fun and challenge for climbers of all skill levels, with unpredictable climbing routes that encourage exploration and creative problem solving. The open layout also provides ample sight lines, prompting interaction between kids (who often ask each other, "Which route are you going to take next?") while enabling parents and caregivers to keep an eye on the fun. Despite its starring role, Branch Out is a team player, with integrated functionality that flows seamlessly into surrounding Playworld components. Rather than competing with surrounding structures, it complements them. The playground's nature-inspired form also harmonizes beautifully with its idyllic ballpark setting. It all adds up to outstanding play per square foot, scoring a rating of awesome from both families and management. 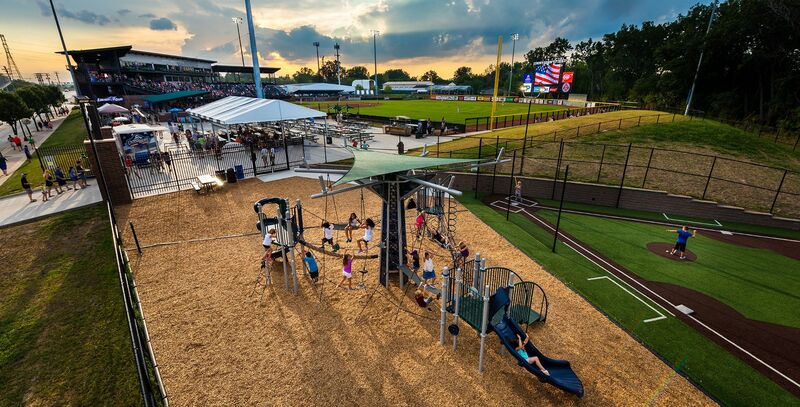 Thanks to the thoughtful planning of the league ownership, and the innovative play design of Branch Out, the playground at Jimmy John's park is proving to be a home run.